State Department says USAID vetted Gaza journalist accused of being a Hamas member and who was killed during riots at Gaza border. 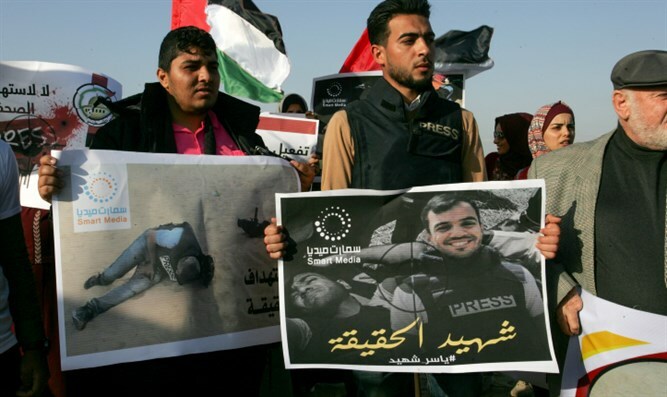 JTA - A Gaza journalist shot and killed by Israeli forces during protests at the Gaza border was vetted to receive funds from the U.S. Agency for International Development. Israeli officials, including Defense Minister Avigdor Liberman, had said that Murtaja was a high-ranking official of Hamas, the terrorist group that controls the Gaza Strip. USAID vetting, in the case of Palestinian Arabs, includes checking with Israeli security officials as to whether the applicant has ties to terrorists, Dan Shapiro, a former U.S. ambassador to Israel, told NPR. Hamas and Murtaja’s family and colleagues have denied any association between Murtaja and Hamas. Liberman did not provide evidence for the claim, nor did officials in Prime Minister Binyamin Netanyahu’s office when they repeated the claim on Twitter. In the past, Israeli authorities have released photos of slain Arabs in Hamas uniform or provided other evidence to support their claims that the dead were legitimate targets.